Guardiola insists he is not just talking about his players, pointing out City defender Nicolas Otamendi kicked Kane in the face in the same game. 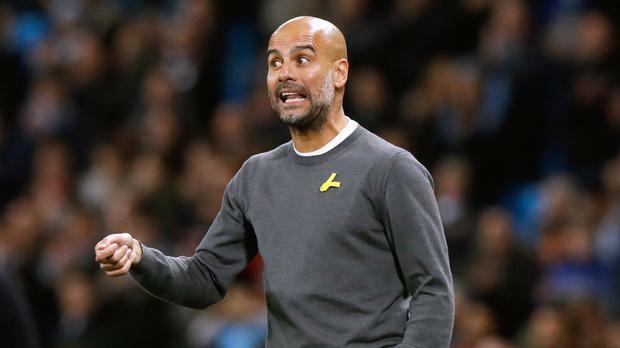 Guardiola said: "I don't believe the players go to injure another one - it is impossible to think that - but the football is quick, fast and aggressive and the refs have to follow the rules. "Everybody is squealing about diving here. If they want to punish those who are diving, it's OK but the main thing the ref has to do is protect the players. "Always we are aggressive and sometimes we get injured. All the teams want to win and want to fight in the best way. I have no doubts that Delle Ali and Harry Kane are top-team players. I am not suspicious or thinking they are dangerous players. "But the most important thing is to protect the players." Guardiola was speaking after highly-rated youngster Phil Foden was ruled out for at least a month with ankle ligament damage suffered in Tuesday's Carabao Cup quarter-final win at Leicester. The 17-year-old, who was making his first domestic start, limped off after being hurt in a challenge from Harry Maguire in the closing moments of normal time. Compared to the tackles on Sterling and De Bruyne, Guardiola feels Foden has been very unlucky. "He's injured, it's not good," said Guardiola at a press conference to preview the Premier League leaders' home clash with Bournemouth on Saturday. "We were lucky with Raz and Kevin De Bruyne in the last game against Tottenham - really really lucky - but we were unlucky with Phil against Leicester. "We were scared, we thought it was the bone, but it's just the ligaments. It will be one month or maybe more that he will be injured." City host Bournemouth hoping to maintain their 11-point lead at the top of the table and extend their English League record 16-game winning streak. Guardiola admits he could never have imagined being in such a strong position at this stage of the season. He said: "I'm glad to be where we are. I would have liked to be here at the beginning of the season, but I didn't expect it. "This is not normal, this is not a situation I am used to. I expect to lose games and drop more points, but I am glad."